Will A Humvee Fit Inside A CH-47 Chinook? We all have seen pictures and video of H-47s Chinook helicopters sling loading as many as two Humvees at a time, but this really degrades the Chinook's range and makes it a huge target. Can the Chinook also transport them internally, where such a high drag penalty would not be inflicted? The answer is YES! The Special Operations guys have been known to load up to two Humvees (aka HMMWV, aka Hummer) into a 160th SOAR MH-47 Chinook with the Humvee's driver, and in some cases its full occupancy, seated inside the vehicles during transport. They do this because when the HMMWV is packed inside the Chinook's cabin, it is such a tight fit that the doors won't even open. On approach to the landing zone the the drivers will start their engine and they will literally tear out of the back of the chopper once the rear ramp is fully supported by terra firma, probably with some help from one of the helicopter's crew chiefs. Carting a full-sized Humvee and its occupants (at least one) inside a lumbering tandem rotor Chinook is a pretty cool capability but it also a risky one. If the helicopter crashes, is hit by enemy fire, or has an on-board fire the troops seated in the entombed Humvee would be stuck inside of their vehicle and would not be able to egress with the rest of the helicopter's passengers and crew. Unless of course, after helicopter came to a stop, the Humvee driver were to pull a "BA Baracus," busting out the rear ramp of the stricken Chinook. I do have to say, such a feat would be one of the coolest things to see go down with your own eyes. With this revelation in mind, let's all hope that none of the Fast and The Furious screenplay writers or Call of Duty programmers are reading Foxtrot Alpha today! 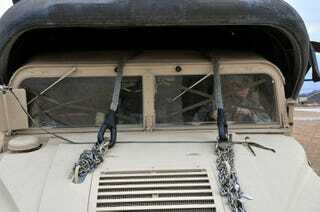 Incidentally, the Spec Ops guys are not the only Chinook operators who cart around Humvees internally. It looks like the Michigan National Guard, or fans of the college, also have a penchant for packing hummers in their Chinooks as well. In other words, it looks like this specialized activity has spread to more conventional Army Chinook units.